Jennifer Twiner McCarron poses for a photo at the Atomic Cartoons animation studio on Nov. 9, 2018, in Vancouver. Jennifer Twiner McCarron is not a yes woman. 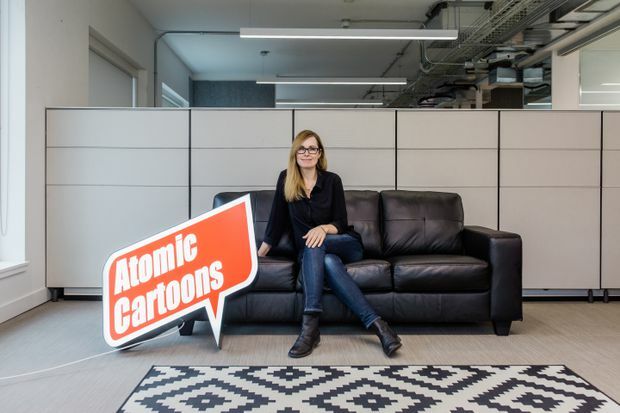 The president of animation studio Atomic Cartoons (Beat Bugs) – recently named CEO of parent company Thunderbird Films (Blade Runner 2049, Kim’s Convenience) – knows that to get what she wants done, sometimes she has to say no. This means choosing projects that make a positive contribution, and turning down those that don’t align with Atomic’s values. So no gore, no guns, no violence. It also means saying no to projects she thinks Atomic’s work force will not feel passionately about, or simply won’t have the bandwidth to complete to the company’s high standards. Under her watch, Atomic has grown from about 20 employees to more than 450. The company now has an office in Los Angeles and is opening one in Ottawa. Twiner McCarron spends a lot of time talking to parents and librarians. She thinks deeply about her audience and the value of her company’s projects. When the co-authors of the bestselling children’s book Princesses Wear Pants were looking to adapt the story for TV, Today co-anchor Savannah Guthrie and educator Allison Oppenheim selected Atomic over Hollywood stalwarts such as Dreamworks. Drew Barrymore’s company Flower Films is executive producing the series and Barrymore will likely voice it. They traded war stories about dealing with their own daughters’ obsessions with princess dresses. Twiner McCarron – who has a 12-year-old daughter and nine-year-old twins, a boy and a girl – loves the empowering message of Princess Penelope Pineapple’s story: It’s okay to embrace your pink and sparkly side, but at the end of the day, what you do is more important than how you look. “And so sometimes you’ve got to put your pants on underneath your princess dress and get stuff done,” says Twiner McCarron, handing me a copy of the book in her tiny office in the company’s new Vancouver headquarters. And yes, she’s wearing pants. Twiner McCarron’s route to animation wasn’t direct. After earning a fine arts degree from Carleton University in Ottawa, she attended the Vancouver Film School. During a short stint as a west coast news correspondent for YTV, she did a story about the animation studio Mainframe Entertainment and was offered a job there as an office production assistant. “I really felt like I just found my tribe.” She rose through the ranks over 14 years, eventually joining Atomic in 2011, then becoming president in 2016, and being promoted to CEO for Thunderbird as well this past summer.